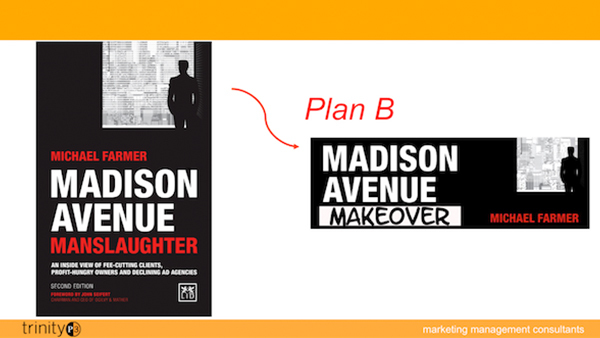 On Tuesday December 4, 2017 Michael Farmer, author of the award winning marketing business book Madison Avenue Manslaughter presented his Plan B for the industry to turn the manslaughter into a make over that would get brands and agencies moving again. This is the transcript and video of the final of three parts of that presentation where he delivers Plan B to the industry. So, mission, and I’m not going to start with pricing, I’m going to start with mission, and I’m ripping a page out of the consulting playbook here. 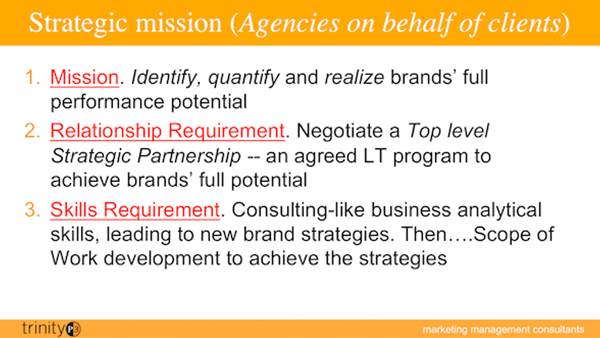 I think the agency’s strategic mission should be on behalf of its clients and it should read something like, ‘our mission is to identify and quantify, and realise the brand’s full performance potential’. It starts with a premise that any client that has a portfolio of brands is underperforming. 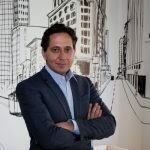 P&G, Nestlé, Unilever, American Express, Ford Motor Company, General Motors, any of the banks, Australian, New Zealand, U.S., Brazilian banks, everybody is underperforming versus their full potential because they have not focussed on figuring out why they are underperforming and what they can do about it. We’re not in business together to develop a digital brand campaign for brand X; we are in business to get your brands growing again. We know how to do it. We know how to figure out where the growth potential is and we know how to execute but we have to work together and it takes time. And then there’s a skills requirement because you have to bring on board in your accounts department the kind of people that can do that business analysis. A young person coming out of university and going to one of the big consulting firms will be trained over 7 weeks in how to do this kind of analysis; how to do a full performance potential analysis. What data do you need? What kind of slides do you use? It’s been recognised but I don’t know of any account heads that ever mobilise their team to do that on behalf of their clients. They’re kind of there, hoping they can get the work out the door without losing the client. A lot of what client service does is to maintain the relationship. So, what’s really needed are consulting, business analytical skills at the front-end and then the ability to put together the type of programme that will actually work. That’s a scope of work expertise where the agency takes responsibility for the scope of work because it has to be the one they want to do. That takes us to scope of work management and given how painful the consulting experience has been for me over 25 years, it’s still having to reconstruct scope of work. I like to see agencies take this on seriously. The agency must design and negotiate the scope of work. Now, clients are going to do it too but I think agencies have to be first out of the gate and say, ‘look, we think that in 2018 the scope that is likely to get our brands back on track is this one; this media mix, this number of deliverables, this number of originations, adaptations, and if that is too pricey for the budget we’ll re-engineer it. We’ll do fewer originations and more adaptations or something so that the scope of work is affordable for you. It’ll be the best scope of work you can get for your money. We will take responsibility for it and then you negotiate it but I don’t know anybody who does this for the most part. Agencies must negotiate fees based on the scope of workloads. Now, if you have a system of deliverables and scope metric units it’s not hard to do. One of my Mexican clients works with Mondelez and they have been successful in getting Mondelez to pay by deliverable. How? Mondelez knows the scope metric value of every type of brief in the scope of work and they use a price per SMU to pay them. Now, Mexico, the right price per SMU is about 500,000 pesos and they’re getting about 500,000 pesos for each of the different types. After having negotiated that all they have to negotiate then is how many deliverables are they going to do and how many SMUs and therefore, what does that add up to. If it’s too much money, we’ll cut back. So, it’s totally doable and the agency’s in charge of getting out in front. Then there is the internal policy, which says, ‘in the agency, for every one of our clients; we will require each account head to document, track and measure scopes of work in a uniform format, using our own system. I don’t know of anyone who does that. Nestlé uses the Decideware so that the agencies that serve Nestlé use Decideware in some form. And others have their own system but I don’t know of any uniform agency method for saying, ‘we’re going to keep the scope of work this way because we need to know in a uniform way what Alpha, Bravo, Charlie, and Delta are doing and who is being overpaid and who is being underpaid and who is being stretched and who isn’t being stretched. 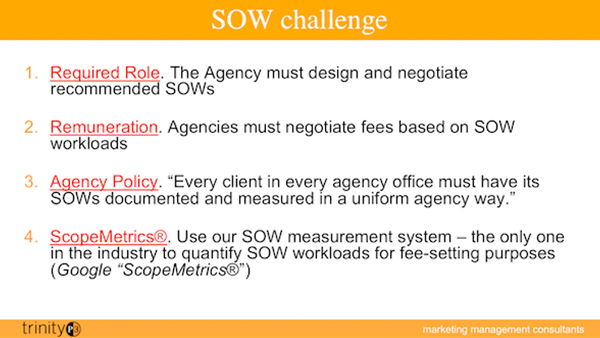 Every client in every agency office must have his SOWs documented and measured in a uniform way. Agency CEO’s eyes glaze over when I say, ‘this is what you have to do’. ‘Aren’t we doing that already?’ ‘No.’ ‘Well, that’s up to each office, London’s got a system for doing that’. ‘No, they don’t’. Anybody that tells you they have a system and they know how much work is going on is not telling you the truth. I understand why they aren’t but nobody in your whole global organisation has a slightest idea, other than the client, roughly what work is going on. Nobody is in a position to review it, look at it, measure it, comment on it, criticise it. Are we working on the right stuff for Nestlé? Is it going to move the brands? Could anybody ask that question? If nobody knows the scope of work other than the person running Nestlé, it’s impossible. So, in a way, agencies have delegated to the account heads the running of the agency without anybody looking over their shoulder to see what kind of decisions they’re making. That’s not good when you have aggressive clients cutting fees. So, the agency must design and negotiate recommended scopes of work. Agencies must negotiate fees. Agencies must use the uniform format. 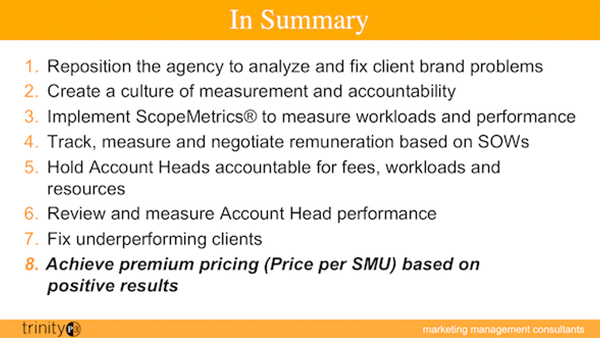 And I’ve got a system called scope metrics, which Darren uses for his clients; it’s available. It’s a scope metrics system. It’s off the shelf. It is simple. It’s like an unlined Excel system that allows you to put in the deliverables and figures out the SMU. Our scope of work measurement system, which is the only one in the industry, sad to say, to quantify deliverables for fee setting purposes. It works and people that have used it have had success. It’s a really hard sell because agency leaders don’t want to manage agencies; they want to develop their clients and let the account heads deal with the crap. Accountability. This is another big business-management issue. Account heads need to be accountable for the decisions they make in the situations they’ve inherited. Think through client Alpha through Juliette. Alpha, Bravo, Charlie, Delta, and Echo were all underpaid and overworked. Their client heads are running that every year and every year they are agreeing to a scope of work and being given a limited number of resources to do it and the work’s killing them. Which of those client’s heads is under management’s eye to say you have got to fix that situation; we cannot accept $34,000 per SMU when we need a minimum of 139 or 150. What are you going to do about the issue? Can you keep the fee and cut back the scope? Can you cut out the 20% that’s crap, that isn’t doing anything for the brands? Could you change the media mix? Could you get more money? Could we work on a different mission? That dialogue isn’t going on. 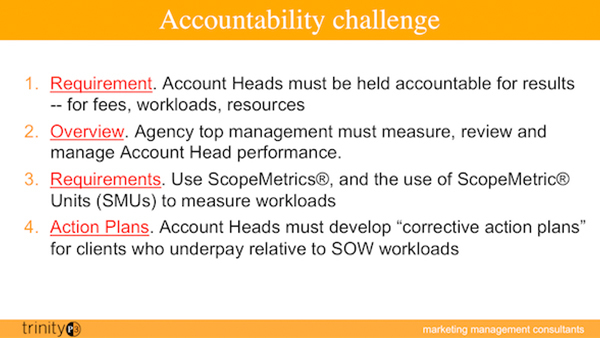 So, account heads have to be accountable but they’re not going to do it themselves. Being held accountable means being held accountable by somebody. Office heads don’t feel like they are responsible for client heads. Office heads are responsible for hiring and making numbers with the finance work. 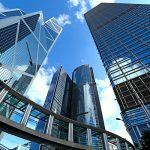 Agency top management must measure, review, and manage account head performance just like General Electric Corporation or any other big company where somebody, who is given a business to run, is held accountable for achieving certain objectives. It doesn’t exist in the agency world because there’s a kind of creative copout like, we are a creative operation, we don’t work that way. The truth of the matter is that in the years that he and I worked together, Saatchi downsized by 30 % because he could not come to grips with the need to manage work load. He let me do my thing there but he didn’t hold people accountable for the situation. There needs to be a uniform system for measuring your work, measuring the price, measuring the productivity, measuring the profitability that allows a comparison across clients, just like you saw at the Icarus agency. Finally, account heads have to develop action plans to fix their bad situations; they may have inherited them. It may not be their fault that their fees are terrible, but it doesn’t matter, they’re stuck with it, they have to fix it. So, in summary, I think if you accept what’s wrong with Plan A then Plan B has to be the following. That’s how you get control of price and it all comes back to price. The repositioning; clients will pay for improved results. They’ll pay agencies if agencies can do it, so repositioning the agency on results is a way of fixing price. Measuring workloads and negotiating workloads is a way of fixing price. Holding account heads accountable is expanding the number of people who worry about these things and can do something about it, so it’s expanding the management team; it’s a way of getting control of price. Ultimately, I would think, the game of advertising is about developing premium pricing from clients that moves up towards the consulting level of the five times multiple because the work is effective. If you wanted to array agencies across the spectrum, who’s really successful and who is not and you had the data on price per SMU of their offices by client and you could compare them, I would bet you that the agency that has the most premium pricing, sustainably over a long period, is the winning agency. So, it says, what we need to win in this industry are; long term relationships, the longest duration of clients and the highest price per SMU that is sustainable. That’s success and those dimensions only exist on this spot, they don’t exist in the head of anybody. So, if you are in a position to think about Plan B, think what we are trying to achieve in the long term is the sustainability of our client relationships and the price premium, from doing really great work that generates results. If you do that, you will have successfully created a Plan B that is not a Madison Avenue Manslaughter but is instead a Madison Avenue makeover.